This effect, to the best of my knowledge, introduces a new theme into slate magic. 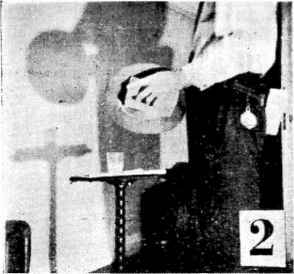 After a member of the audience has been inveigled into assisting the magician he is handed a slate, and then from a box of coloured chalks is asked to select any one he wishes. With this piece of coloured chalk he is asked to draw a pattern on the slate. Whilst he is doing this the operator picks up a slate and on it draws with zvhite chalk the figure of a pentagram. Each slate is now marked on the side opposite to the drawing, the assistant's with his initials the operator's with his own. The assistant's slate is now placed drawing side down on the floor, and he is requested to keep his foot in place on the frame of the slate. Now the operator recapitulates in this way . . . " Your representative, ladies and gentlemen, has drawn a design selected from several, a triangle in green chalk on a slate which bears his initials and is now wedged between his foot and the floor. On the slate, which I am holding, I drew the design of the pentagram . . . Watch a strange feat of magic, the two drawings are going to change places. If, ladies and gentlemen, I were a mere conjurer, I should cover the slates possibly with tubes or handkerchiefs. Being a magician, I do nothing of the kind . . . iust watch ! " The operator at this point holds his slate about three feet above the spectator's, and then slowly turns it round. On it is seen the spectator's drawing. " Will you now " (this to the spectator) " please lift up your slate and show it to the audience ? " The spectator does so. On it is seen the operator's drawing of the pentagram ! Believe me, when the spectator does show the audience his slate there is a gasp, for the freedom of handling makes the effect so convincingly magical. The requirements are very simple and the effect can be set up in a couple of minutes. These are the things that the reader requires :—two slates of similar size and with a flap common to both. I am using two Wandman non-locking slates, the machine finish plus the strong bakelite beds making these ideal for this effect ; half-a-dozen pieces of different coloured chalk in a small box ; a piece of white chalk. A piece of cardboard, size fourteen inches by twelve inches completes the requirements. The preparation is as follows :—One side of the piece of cardboard is divided into six equal parts and in each part is drawn a simple design (see A). On the other side is drawn a large pentagram (B). Readers will realise that once this is done it is good for all succeeding presentations. We will suppose that one slate is A and the other B. On slate A the operator draws a pentagram, nearly filling the slate. On one side of the flap he draws a similar sized pentagram. This flap is now fitted into A, so that the two pentagrams ' kiss ' one another, and to all effect, the operator has now two slates blank on both sides. A, flap side uppermost, is now laid on top of B, and both placed on the table. Box of chalks is nearby and the piece of white chalk in operator's pocket ; the card with the six designs showing is displayed upright against chair back. The stage is now set for the . . .
Presentation.—The spectator is invited to assist, and is seated on the operator's left. The topmost slate, A (with the flap), is handed to him* Some readers may think that this is risky, but the mere action of handing the slate to a spectator allays all suspicion. During the last couple of months I have used this effect some couple of dozen times with both children and adult audiences, and never once have I known a spectator do more than casually look at the slate.) He is then asked to choose one of the coloured chalks. This done, the operator either points to, or picks up, the cardboard showing the designs and requests the spectator to reproduce one of these as largely as possible on his slate. Whilst this is being donej the operator removes the white chalk from his pocket a»d on the slate B, draws a pentagram. The spoken line is, " and whilst you are drawing your design, I will draw something more complicated with white chalk." The operator allows the writing side of his slate to be exposed to the audience so that they can see his drawing. It is held in the left hand drawing side up. Taking the assistant's slate the operator holds it up so that the audience can see the design drawn by their representative. (Care must be taken that the flap is retained in position.) Then, " So that there can be no mistake I shall mark both slates. What are your initials ? " The assistant tells the operator his initials, the operator turns the assistant's slate over on to his own, and squaring the two and allows the flap to drop on to his own slate' Now the spectator's initials are placed on the slate it is removed, placed on the floor (care is, of course, taken that the audience do not see the underside of the slate) and the assistant requested to put his foot upon the frame. (Because the flap carrying the spectator's drawing had on its reverse a duplicate of the operator's drawing the slate left in the operator's hand looks unchanged.) This latter is now turned over and the operator writes his own initials on the blank side. During or immediately after this writing (this is a matter for the individual) the flap is allowed to drop slightly and it is moved into a position where it projects about an eighth-of-an-inch over one side of the frame (see C). The operator now turns over his slate, holding it by the right hand, and picking up the card bearing the designs uses the words given in the description " Your representative, etc. ", and at the same time points with the slate (see C) towards the chosen design. (Note that the card is held at the edge between the first and second fingers.) The slate is passed from the right hand so that it is gripped by the first finger and thumb of the left hand. As the operator remarks " I drew the design of the pentagram," the left hand turns card and slate round so that picture of the pentagram faces audience. To this the operator gestures with his right hand. Under cover of the cardboard the left hand thumb, with a sliding movement, brings the flap across the frame of the slate (see D). The right hand now goes behind the cardboard, takes the slate and leaves the flap behind gripped by the thumb and first finger of the left hand (E). The great point here is to avoid this being done noisily. Firm but relaxed handling is essentia!. The operator shows the slate once more . . . his initials on one side and, of course, the original pentagram on the othei. At the point " were I a conjurer, etc." the operator with a synchronised movement brings the slate partly behind the cardboard and turns the card over so that as the card is finally turned the slate covers the flap (this is an easv and natural move which jusc needs timing). The fingers of the light hand hold the flap and the thumb and first finger of the left hand releases their hold. The left hand now gestures with the card towards the assistant, and at the same time the right hand aligns the flap into its recess. Because of the manoeuvre outlined, the flap has been turned over and the operator now has the spectator's design on his slate. This latter is now held above the spectator's slate ... it is turned round, and the design of the spectator shown to the audience . . . the assistant picks up his slate . . . and believe it or not there is the operator's drawing. Before deciding on the method employed for turning over the flap I tried many methods . . . under silks, paper, in paper bags. All were practical, and, in a couple of cases, easier, but in the end because of the fact that right up to the last minute the audience see the design on the operator's slate, I decided to use this for myself. In publishing " Porous Glass "—in our secopd issue— we made mention that this effect was published in an American magazine. We have now traced the source and find that credit should go to Tan Hock Chuan. To him we will pass on the many thanks of readers for the republication of this splendid impromptu penetration effect.
" On the Beam " and " Triple Coincidence "—in Magiens Verdett, were the result of a misunderstanding. Mr. Hubert Lambert, who had sent these effects to the Editor to use personally, was himself amazed when he saw them in print. From all sides and from our own experience this must have been one of the busiest of all Xmas seasons, reminiscent in some ways of the immediate period after the first World War, plus an added factor that fees have been much higher. The Magic Wand Year Book has just come to hand, and we congratulate the publisher on this pioneer venture. 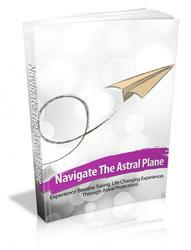 Within its eighty pages there is contained a wonderful assortment of valuable information. In the section " Tricks of the Trade," the reader will find all that information which at one time or another he meant to make a note of and then forgot. Mr. Armstrong has put it here for you—all in alphabetical order !